INCOGNITO THEORY is the high energy, rockin’ side project of Jersey’s own DAVID INCOGNITO. 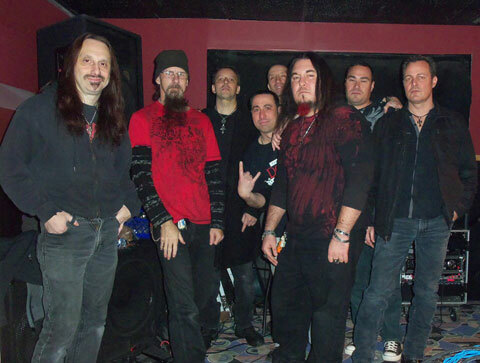 A “superband” of sorts, INCOGNITO THEORY includes members of death metal band Dying Eyes of Sloth and Gathering After Ashes. Their latest EP (“Desire”) and live performances also include guest appearances by Mike Lepond (of Symphony X) and Lee Richards (of Godsmack, Dropbox, and Richards/Crane). This week’s featured song “DRAW THE LINE” will knock you out with a confident one-two punch. Get ready to blast this one on your car stereo. MADYSIN: What was the inspiration for writing “Draw The Line”? DAVID INCOGNITO: Lyrically, “Draw The Line” is about taking a stand— a stand on life, having a backbone, never backing down, and fighting for what you believe in. Musically, I have to thank my band— Brian Wright (guitars and bass) and George Nobre (drums) of the band Gathering After Ashes, who wrote the song. We also had an amazing producer, Jay Prussic, who was also the lead guitarist. MADYSIN: What is your favorite line of lyric from “Draw The Line”? DAVID INCOGNITO: “Anguish rolls off my skin like rain”. MADYSIN: Describe your overall sound. DAVID INCOGNITO: We are a hard rock metal explosion. DAVID INCOGNITO: My biggest influence vocally…I have too many. But if I had to pick one if would be Scott Weiland of Stone Temple Pilots. MADYSIN: What’s your favorite local hang out? DAVID INCOGNITO: Dingbatz and Dingo’s Den in Clifton, and Starland Ballroom. MADYSIN: What is your favorite non-original song? DAVID INCOGNITO: “The Show Must Go On” by Queen. MADYSIN: Where are you from? DAVID INCOGNITO: I’m from New Jersey, born and raised. MADYSIN: When is your next local gig? DAVID INCOGNITO: April 23rd at Dingbatz. Both of my bands will be performing— my main band, Dying Eyes of Sloth, and INCOGNITO THEORY. Mike Lepond (of Symphony X) will be performing with INCOGNITO THEORY on bass. The other bands performing are Gathering After Ashes, Lyken 21, Flathead Sky, Iron Front, and Lunatic Fringe. MADYSIN: What’s next for you? DAVID INCOGNITO: We are currently working on our full length album, titled DRAW THE LINE, to be released in the fall. We’re also shooting a video for our brand new single “Desire” with videographer Marc Patrick. It’ll be out at the end of May. MADYSIN: What is the biggest thing you hope to accomplish this year? DAVID INCOGNITO: Since this is a side project featuring members of my main project, Dying Eyes of Sloth, and Gathering After Ashes, the sky’s the limit. INCOGNITO THEORY is about uniting the scene. Hopefully we’ll get a tour. We’re a bunch of brothers that love to play music. Music is life. MADYSIN: Where can people grab your music? DAVID INCOGNITO: You can grab our stuff digitally at IncognitoTheory.bandcamp.com. We have Facebook, Twitter, Reverbnation, and right now you can grab hard copies of our EP at shows. Stay tuned for the new rock and metal revolution that is INCOGNITO THEORY. Thank you all very much. Connect with INCOGNITO THEORY at www.facebook.com/IncognitoTheory. Grab their music on Bandcamp. Madysin Hatter is a Singer/Songwriter/ROCKER. Have a song you’d like to have featured? Visit www.MadysinHatter.com to submit. CLICK HERE to hear all the SONGS OF THE WEEK!